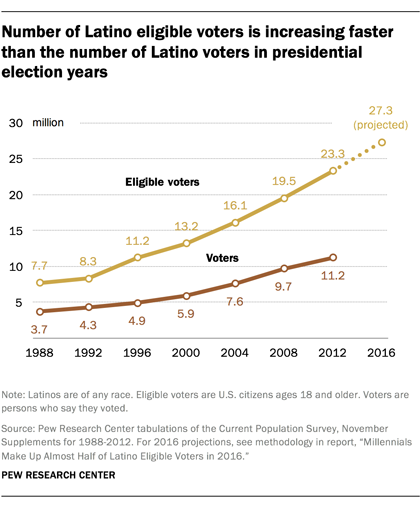 Significant growth in the number of Latino eligible voters has helped make the U.S. electorate more racially and ethnically diverse than ever this year. According to Pew Research Center projections, a record 27.3 million Latinos are eligible to cast ballots, representing 12% of all eligible voters. Since 2012, the number of Hispanic eligible voters has increased by 4 million, accounting for 37% of the growth in all eligible voters during that span. The Hispanic share of eligible voters in several key battleground states has also gone up. Latinos have favored the Democratic Party over the Republican Party in every presidential election since at least the 1980s, but their electoral impact has long been limited by low voter turnout and a population concentrated in non-battleground states. Despite large growth in the number of eligible Latino voters, it remains to be seen whether their turnout will set a record in November. Here are key facts about the Latino vote in 2016. 1Millennials make up 44% of Latino eligible voters and are the main driver of growth in the Latino electorate. From 2012 to 2016, 3.2 million young U.S.-born Latinos came of age and turned 18, accounting for 80% of the increase in Latino eligible voters during this time. 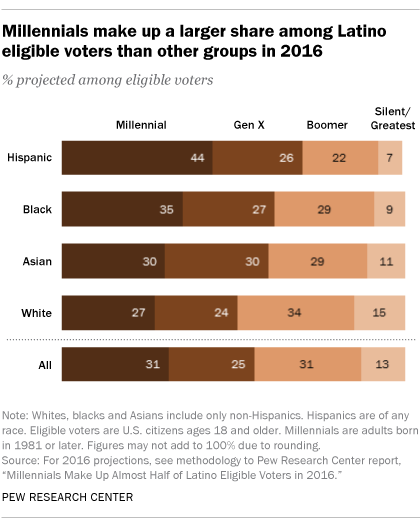 2Among Latino registered voters who are “absolutely certain” they will vote, one-in-five will be voting for the first time, according to Pew Research Center’s National Survey of Latinos, published this month. Among Millennial voters, 36% say they will be casting a ballot for the first time, compared with 9% of non-Millennial voters ages 36 and older. 3There are only a handful of competitive states in this year’s presidential election where Latinos account for a significant share of the vote. Out of seven competitive states, Latinos have a significant presence in three: Arizona (22%), Florida (18%) and Nevada (17%). Latinos make up 5% or less of eligible voters in each of the remaining four: Georgia, Iowa, North Carolina and Ohio. At the same time, the impact of the Latino vote on the presidential race is lessened by the fact that more than half (52%) of all Latino eligible voters live in the non-battleground states of California, Texas and New York. 4Hispanic registered voters have grown more dissatisfied with the nation’s direction. In 2016, 57% of Hispanic voters say they are dissatisfied with the way things are going in the country, up from 50% in 2012. Among them, those born in the U.S. are more dissatisfied than immigrants, 63% to 45%. 5A slightly lower share of Latino registered voters say they are sure they will vote this year compared with four years ago. This year, 69% of Latinos are “absolutely certain” they will vote in November, down from 77% in 2012. In past elections, the Latino voter turnout rate has lagged that of other groups. For example, in 2012 Latinos had a turnout rate of 48%, compared with 67% for blacks and 64% for whites. 6Latinos have long viewed the Democratic Party as having more concern for Latinos than the Republican Party, but their views of Democrats have fluctuated. In 2016, 54% of Latino registered voters say the Democratic Party has more concern for Latinos than the Republican Party, while 11% say the same of the GOP. Democrats have maintained this advantage since 2012, though the share of Latinos who say Democrats have more concern for Latinos has declined modestly since then, when 61% said this. About one-in-four Latino voters say there is no difference between the parties on this measure. 7Hillary Clinton has more enthusiastic support from older Latinos than from Millennial Latinos. Two-thirds (64%) of Millennial Latinos (ages 18 to 35) who back Clinton say their support is more a vote against Donald Trump than for Clinton. The reverse is true among older, non-Millennial Latino voters (ages 36 and older): 65% say their support of Clinton is more a vote for her than against Trump. Overall, more than half (55%) of Latino registered voters who back Clinton say their vote is more a vote for Clinton than against Trump. 8Three-quarters of Hispanic registered voters say they have discussed Trump’s comments about Hispanics or other groups with family, friends or coworkers. Those who have discussed Trump’s controversial comments on Hispanics, Mexican immigrants and other groups in the past year have given more thought to the election and are more certain they will vote. Can Amazon Transform Health Care? Should England nationalise water services? Make the internet American again? What Happens to Bannonism After Bannon?